Cellular physiology relies on the accurate deployment of every gene product to the correct cellular compartment. Fully one third of the proteins encoded in eukaryotic genomes navigate the secretory pathway, entering this system via the endoplasmic reticulum (ER). Research in the Miller lab is broadly aimed at understanding basic mechanisms of secretory protein biogenesis, focusing on protein quality control within the ER. We use the budding yeast, Saccharomyces cerevisiae, as a model system, which affords facile biochemical, genetic, genomic and proteomic tools. By using such a tractable model system, we can rapidly discover new pathways and dissect mechanisms that may be directly relevant to a number of human diseases, most notably cystic fibrosis and similar diseases of protein misfolding. Cargo adaptors, Sec24 (red) and Lst1 (green), bind to discrete sites of the ER that are involved in vesicle formation and protein export. Sec24 acts by binding distinct ER export signals (asterisks) on cargo (eg. Yor1, green) and cargo receptors (eg. Erv14, brown). In some cases, simultaneous binding to 2 independent signals is required for maximal ER export. The molecular basis for vesicle formation from the ER is relatively well understood and relies on cytoplasmic coat proteins known as the COPII coat. Yet, despite a relatively deep understanding of the mechanisms that drive COPII vesicle formation and cargo capture, we know very little about how this process is regulated to prevent improper traffic of misfolded proteins. We study this problem from two angles: a “cargo-centric” approach examining the folding and trafficking of an individual protein, and a systems-level approach to characterize quality control more broadly. We use high throughput yeast genetics to identify new components that act in various aspects of protein quality control, and biochemical approaches to dissect mechanism. One long-term goal is to understand how vesicle abundance and architecture can adapt to changing physiological needs with respect to cargo load. 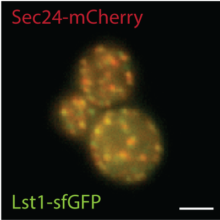 Sec24 phosphorylation regulates autophagosome abundance during nutrient deprivation. Local concentration of p24 proteins and COPII coat composition mutually influence Sec13p-dependence and membrane scaffolding. 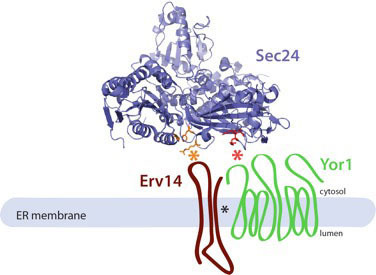 Sec24 is a coincidence detector that binds both cargo proteins and the cargo receptor, Erv14, to drive ER export. A yeast phenomic model for the gene interaction network modulating CFTR-ΔF508 protein biogenesis. ER cargo properties specify a requirement for COPII coat rigidity mediated by Sec13p.